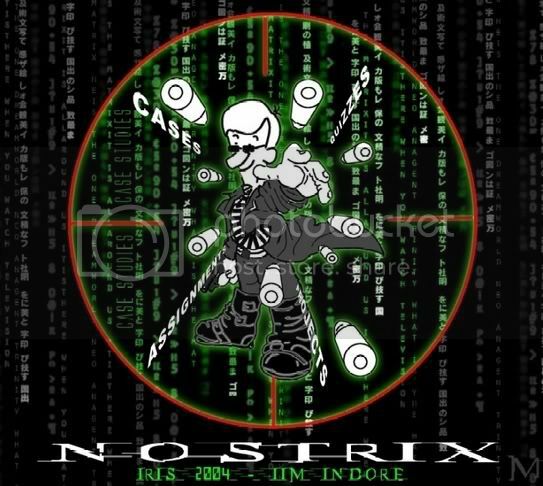 We (Jhasketan, Shadab and myself) the Nostro team in IRIS have made this wallpaper. 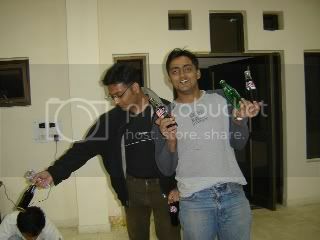 It was huge hit on the lan. almost 50% of ‘i’s have it on their desktops. 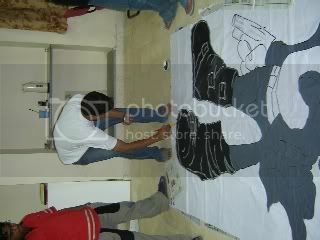 Then, we got the idea of making a huge (10-15 feet) cutout of the same and make it ready for the event. This decision was made on 2nd november. We got 3 days to roll out the cutout. 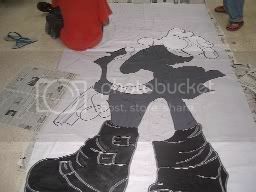 We first thought of drawing him on a big cloth part by part. But that was really dificult. This is where the technology helped us. Jassi bought the banner cloth from city on 2nd evening. 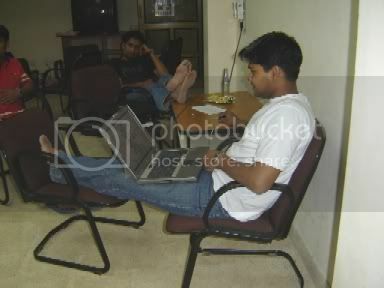 3 of us along with dhawal, dandu and sanchit went to pgp1 classrooms at night 10. we have loaded the nostro image in one laptop and took it there. We used the projector to blow up the nostro on the screen. Then we sticked the cloth to the screen and drawn it in phases. Phew… we had a huge nostro infront of us by 12:10. 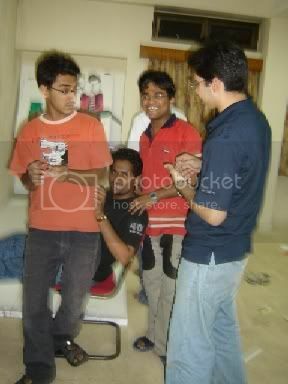 Back in hostel rooms that night jassi completed darkening the pencil lines. After a hectic day at acads with 2 quizzes we started off agian in the evening. Jassi brought in the thermocoal sheets. We occupied D-block common room along with our cloth, thermocoal, colors, tapes and laptop. First task ahead of us is to make a 10 by 5 feet structure using thermocoal. The sheets were 100 by 50 cm. We used fevicol to join 3 sheets side by side and then we used nylon thread to keep the pressure on the sheets. Meanwhile Jassi went to city and brought in lots of fabric colors and more fevicol and thermocoal sheets. Jassi and shaddu started painting the cloth with colors. After a couple of hours we have removed the threads to check whether the sheets are attached firmly or not. Well, they are fine. The next step is to attach these 3 by 1 sheets side by side to make a 10 by 5 feet strucuture. After another round of making hands sticky at about 2:30 we are done with attaching the sheets. The next step is to complete the painting. After a couple of hours the paint got over. We still have nostro’s face and hands to paint. At that hour of day no body would sell paints. After doing some odd-works, finally at 5:20 we all crashed. We met at 10:00 in the common room. 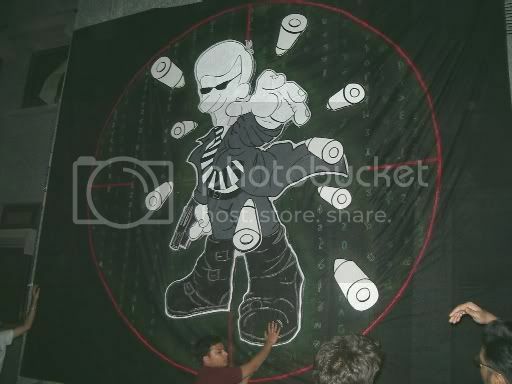 Jassi and meself left to city to buy colors, fevicol and black banner cloth for background. Jassi came back while i stopped over at Rau village to get the tailoring of the banner cloth done. I came back to common room at 12:30. By that time Jassi and Shaddu completed cutting the shape out of both thermocoal and cloth. We all started making the ‘matrix simulation’ on the black cloth. It came out very well. By the time matrix is done it was 3:30 types. I left the room to recieve some IIM L students for whom shaddu and myself were Participant Co-ordinators in IRIS. When i came back at 5:45, the thermocoal along with cloth is attached to the banner. And the matrix is also ready. It looked great. The next step is to make the bullets out of thermocoal. I had to leave the room again to meet the next contingent of L chaps. By the time i am back in common room, some 10 ppl are trying to bring out nostro and attaching ropes on all 4 edges of the banner. 9:45 pm we all started carrying nostro to the mess. It was team work at its best. With 10-12 ppl carrying the strucuture whose weight couldn’t be more than 15 KGs. Once we are outside the mess, couple of us left to the 2nd floor to lift him. People were operating from bathrooms, rooms, terrace. After one hour the hero stood against the wall. And my boy, he looked GREAT. Phew, that is 2 fulldays of toil and harwork. Allmost all the participants in IRIS said that Nostro is kewl. Some photos of the cutout here.